Andrew Harvey, author of more than 35 books including The Hope and Radical Passion and Professor David Tacey, Professor of Humanities, La Trobe University, author of 14 books on spirituality and depth psychology, including “Edge of the Sacred”, “ReEnchantment”, and “The Spirituality Revolution” in dialogue about the Mystical path. For those attending any of Andrew’s other Warburton events (except the SAT evening film) it will be $20, otherwise $35. 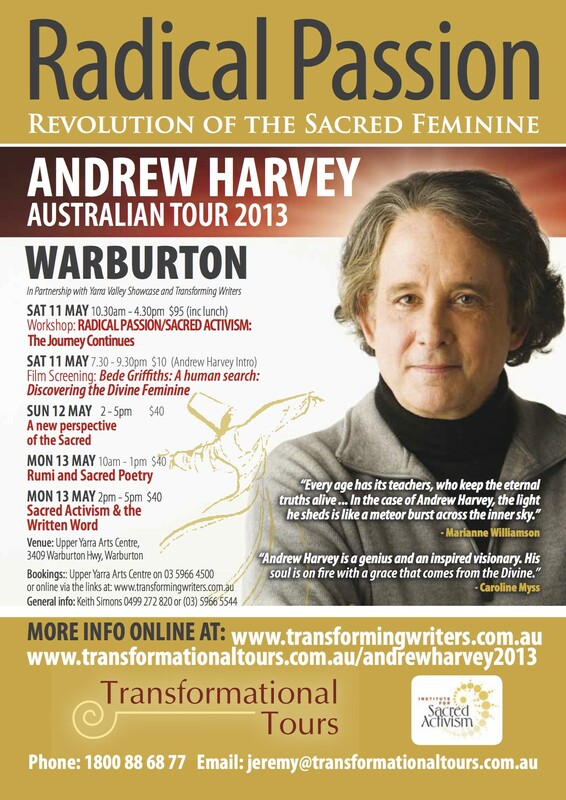 Author of Sacred Activism – the Hope, Andrew Harvey has landed in Australia and its just over a week until we will be blessed with his presence here in Warburton. We have a wonderful series of workshops on offer over the weekend of 11-13 May from only $40. Follow the links onwww.transformingwriters.com.au to book, or for workshop info, or call the Upper Yarra Arts Centre on 1300 368 333. We do hope you can join us. We are offering a catered light lunch on the Saturday so if you are planning to come along, your timeliness with making your booking will really help us with catering. Thank you! Check out both April and May issues of Nova Magazine (available online) to read articles by Andrew on Rumi and the Divine Feminine. Inspired reading in preparation for what promises to be a workshop series that will ignite your own passion from the core. In a world cluttered with messages, overwhelmed with information and desperate for the caring actions of individuals like us, Andrews life work is direct, full of integrity, about action not words and essential.